A jar of dried oregano costs $4. I actually bought one last winter. It was a new experience. I was making spaghetti and I ran out of oregano. My plants were at the farm and rooted into the ground in a way that made it very difficult to harvest. So I headed out to the store. I always thought of my herb plants as a discretionary item. Something a customer bought for enjoyment. But that spaghetti wasn't going to flavor itself! That jar of oregano cost $4 plus tax, time and mileage. We sell oregano plants for $3. If you use every leaf on the plant, they will grow back! Now I'm using those plants as part of my save-money plan! You will need a container. My kids learned a new word: dumpster diving. I was lucky enough to find a basket with a broken handle on top of my neighbors' garbage. This won't work perfectly forever, but it will work just fine for right now. Looking around, especially at other people's garbage always sparks new ideas. My house can be a raging mess, but when I walk into somebody else's house, I'm motivated. I've seen a million pictures of things planted in containers: shoes, old jeans, purses, wig heads. My own stuff never looks like something I want to fill with dirt, but my neighbors' stuff does!! This basket is way bigger than I was looking for, but there are several herbs I use that I don't want to buy: oregano (2), parsley (2), basil (2), sage, rosemary. 8 plants at $3 each is $24. Soil and fertilizer are already paid for. Basket was free. $24 divided by $4 jar of herbs means we will need to produce 6 jars of dried herbs to pay for this. 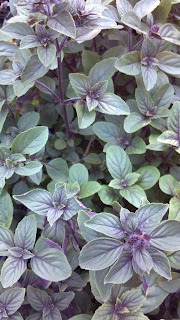 Or 8 packets of fresh herbs at $3 each. That will be no problem! We can probably do both! Double back on investment cost, just like the vegetables. This is another easy project. Planting time will be about 15 minutes - not counting shopping for plants and dumpster diving. I had an old sheet in the garbage I lined the basket with it. It will keep some of the dirt from rinsing out and is porous too. Next I put 2-3 inches of soil in and sprinkled 2 tablespoons of the slow-release fertilizer we bought for the veggies. I dug little intentions and placed a plant in each. Rosemary and sage got corner spots because they like to dry out. Then I filled it the rest of the way with soil. Tah Dah! In about a week, start harvesting sprigs and using the herbs. Dry leftovers in the microwave and put them in a jar or sealed bag. The quality of home grown fresh and dried herbs will be noticeably superior to what is available in stores. Jars of dried herbs make great gifts too! Great advice. And for things that I run out of in the middle of winter or can't grow here (due to the short summer), I get from the hippie/natural/organic store in town for super cheap. That $4 jar of oregano costs me like $0.20 to refill from the bulk spices area of the local natural foods store. That's a great tip! I wasn't going that far, but refilling with bulk is another good idea. I'm a newbee(sp?) to buying vs growing.